Are you in the midst of grief? Do you wonder if you’ll ever enjoy life again? You may feel like you’re going "crazy" or "losing it." You’re not! You’re grieving the death of special person you dearly love. ```We grieve because we love and this is normal. Normal grief throws ones life into chaos, mentally, emotionally physically and spiritually. It is painful and harder then you thought it would be. Finding out what is normal will help you hang on to hope and know that healing will come. feeling like you're going "crazy"
This is a time to be gentle with yourself. Take one step at a time and allow yourself to heal. There is no “quick fix” or microwave solution. It takes time and effort to heal. The loss of a loved one is not an event it is a process, a journey. You do not have to do this journey alone and I don’t recommend that you do. Seek out help from others. Attend a grief support group. Maybe some counseling will be the route to take. I can come alongside you as your travel through your grief journey and offer resources along the way. Contact me at (559) 577-3994 to see if counseling might be right for you. Posted on February 23, 2016 by Patty Behrens and filed under grief, suicide loss, loss and tagged grief loss grieving loss of loved one. Suicide survivors often suffer alone and in silence. The social stigma that accompanies death by suicide can leave them feeling abandoned which only complicates their grief. Survivors grief is already overwhelming and complex. Not only are survivors experiencing grief of their loved one, they are experiencing unexpected traumatic loss and the social stigma of death by suicide. They need support more than ever. According to the American Association of Suicidology, a quarter million people in the US become suicide survivors each year. If a friend or family member has experienced the death of a loved one from suicide, you may not know what to say or do. Here are some tips that will help you come alongside them and provide positive action. Survivors need the same, (if not more) support as others in grief. Squash your curious instincts to know more about the death. Be caring and compassionate. Tend to the practical and emotional needs of the person. Grief after suicide is complicated and survivors may be overwhelmed with their feelings that are stronger, more intense than grief from other types of death. They may have explosive anger and struggle with guilt and shame. They may need to tell their story over and over again. Listen and be compassionate. Survivors need to be free to express whatever they are feeling in order to heal. This is not the time to express your attitudes or beliefs about suicide. It would be helpful for you to research why you believe what you do about suicide - There are a lot of false beliefs and thoughts that do not help survivors. For those with religious beliefs, the statement, “The deceased will not go to heaven” is falsely stated and causes added injury to survivors. For more information see Kay Warren's article and Catholic Digest. Survivors can be “cut off” or avoided because of the type of death. This can happen with any death but is magnified with suicide. The stigma surrounding suicide can cause shame for the survivor and a sense of “helplessness” for relationships. Fight the urge to flee. Intentionally make contacts, visits, send notes, texts . . . stay connected. Your physical presence without criticism is a valuable tool for healing. Survivors often judge their own actions, attitudes, and responsibilities related to the death. They can be plagued with “why” questions and “if only” statements adding to self guilt. Do not agree or disagree, just listen and do not blame any one else either. The urge to refute the self blame comes up, (“You couldn’t have known” or “there’s nothing you could have done”), stop yourself from saying those statements. Let the person come to their own conclusion. They just need you to listen. Listen and allow the person to tell you what they need and what they’re going through without judgement. Refrain from offering a cliche or trite statement to “fix” what the person is thinking or feeling. Do not state, "I know how you feel" or "I can imagine what you're going through." You don't . . . even if you have experienced a death by suicide. Everyone's grief is unique and the relationships are all different. Allow the person to speak their thoughts aloud. You don't have to say much of anything and you do not have to answer their questions. Survivors need to state their thoughts and questions. Answers are not needed. Learn from them. If you or someone you know is feeling hopeless or has expressed not wanting to live, get help now. Call 1-800-273-8255. 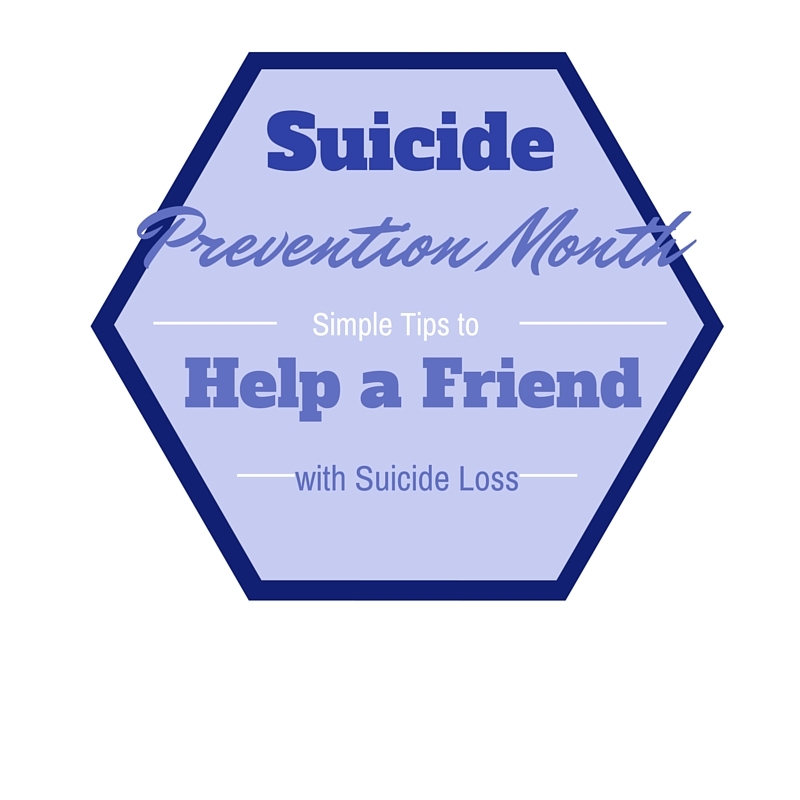 For more resources and ways to help loved ones, go to the suicide prevention prevention lifeline and survivors of suicide sites. For professional counseling, referrals and resources, give me a call or sign up for my emotional health and wellness newsletter. Posted on September 16, 2015 by Patty Behrens and filed under suicide, suicide survivors, suicide loss and tagged suicide grief suicide loss survivors of suicide suicide help.